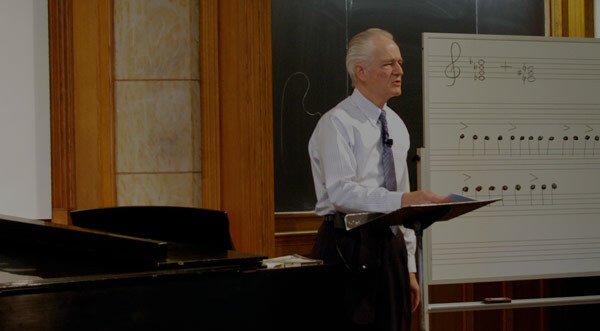 In this lecture, Professor Wright teaches the students about musical Impressionism. While his discussion focuses on the music of Claude Debussy and Maurice Ravel, he nonetheless draws examples from other composers, as well as painters and poets who worked with a similar aesthetic style during the same time period. The class concludes with a performance of Ravel’s “Ondine” by guest pianist Naomi Woo. Professor Craig Wright: Now today we’re going to be talking about musical Impressionism — next time modernism, but today musical impressionism. Impressionism, generally speaking, is a period in the history of music running from 1880 to 1920. It’s mostly a French phenomenon although it did expand, as we will see, to England and to Italy and to the United States even to some degree. We have the American Impressionist School of Art, for example. Let’s turn to the board here and visit some familiar names and faces. You know of the painters: Manet, Monet, Renoir, Alfred Sisley, Camille Pissarro, and the American — interesting enough — American woman, Mary Cassatt. Any time an art museum needs to raise cash, what sort of exhibition do they put on? A blockbuster exhibition of Impressionist painting. That’s what brings everybody in. It is the locus, somehow, of what art is supposed to be. Everybody loves these Impressionist exhibitions whether it’s Boston, New York, Chicago, wherever it might be. So we have those artists. We also have the poets — though interestingly enough they’re not called so much Impressionist poets. They’re called the Symbolist poets, and I’m sure in literature classes and in French classes you have studied some of them: Charles Baudelaire, Paul Verlaine, Arthur Rimbaud, and Stephane Mallarmé. Turning now to the composers, the most important of these, really, is Claude Debussy. He sort of started this school of French composition, the Impressionist style. We list others up there — Maurice Ravel. We’ve bumped into Bolero of Ravel; Gabriel Fauré wrote some beautiful Impressionist music. You may have heard of parts of the Fauré “Requiem” from time to time; Ottorino Respighi, an Italian, suggesting that this also got to Italy; and the American, Charles Griffes, who died of the influenza in New York City but wrote some Impressionist piano and orchestral music. In terms of the works of these individuals, we’ve listed more over here for Debussy than any one else — Clair de Lune, that we’re going to be talking about today, that’s important, Prelude to the Afternoon of a Faun. — we’ll be hearing some of that and you have your Listening Exercise 40 on Prelude to the Afternoon of a Faun, other orchestral pieces, Nocturnes — sort of night mood pieces, La Mer, a big orchestral composition, Images, more orchestral works, and then preludes for piano. And we’ll be foregrounding those preludes for piano here today and a couple of pieces that we listed on the board: the “Ondine” from Gaspard de la Nuit [of Ravel] that will be performed for us later in the hour today, and the Bolero that we have mentioned before. So those are the players. Let’s take a look now at what this music sounds like. I’m going to start with playing some of this piece that you all know. I’m sure you’ve heard this before: Clair de Lune (1890) [plays piano] And we’ll pick it up from there in just a moment. But obviously — [plays piano] we’ve talked a little about this before — this general relaxation caused by the falling down motive only to rise up [plays piano] at this point. But also of interest here is the absence of any kind of clear-cut meter. That’s, I think, the big-ticket item here. You’d be hard pressed to tap your foot to this, to conduct this in any way. So that takes us through, oh, the first twelve, fifteen bars of this piece. Now a different kind of music. [plays piano] Let’s pause on this for a moment. I’ll be emphasizing the phenomenon of parallel motion today — parallelism today — and here is a moment of that. [plays piano], all the voices. They probably have six different notes [plays piano] in that chord, but the next one [plays piano] all six are going in the same direction rather than having — going in the opposite direction. We’ll continue to elaborate on that as we proceed. [plays piano] Okay. Now that’s another interesting moment. We’ve had — we’ve got this sound here to begin with [plays piano]. Well, that’s kind of — [plays piano] And then the next chord is [plays piano]. We haven’t had those chords before. We’ve had major triads, we’ve had minor triads, we’ve had diminished triads and now we’ve got the kind of flip side of the diminished triad — the augmented triad. This is the fourth of our triads. Major [plays piano] — we’ve got a major third on the bottom and minor third on top. Minor, [plays piano] changes those around, [plays piano] a minor third on the bottom, major on top, major, [plays piano] minor. Then we could have — we have got this sharp, biting chord called [plays piano] the diminished if we just two minor thirds. It’s the most narrow of the triads, [plays piano] but supposing we had two major thirds in this aggregate, [plays piano] yeah, that kind of sound. Well, it’s a little bit weird [plays piano] so we get once again a new chord here with the Impressionist — the augmented triad, [plays piano] — and we might kind of pile them up [plays piano] in this fashion. [plays piano] It’s a different sound, kind of a strange sound. All right. Well, that’s a little bit of Clair de Lune of Claude Debussy and that introduces us to the Impressionist style. We’re going to move on now to first — the first orchestral piece of Debussy and that’s the Prelude to the Afternoon of a Faun that’s listed on the board there. In 1894, Debussy lamented that he had never created a masterpiece. Well, he sort of did with this piece. It’s really a wonderful, wonderful composition. It goes about ten minutes and you’ve got the full composition there on your CD No. 5..
What can we say about it? Well, first of all, Prelude to the Afternoon of a Faun: its point of inspiration was a poem by Stephane Mallarmé. Mallarmé was an aesthetic mentor of Debussy. They were close friends. Once a week they would meet and talk about aesthetic issues in Paris in the Boulevard Montparnasse area. So he — Mallarmé — had written a poem called “The Afternoon of a Faun.” Now this faun here is not f-a-w-n, the little baby deer-type fawn, but f-a-u-n, a sort of randy satyr, half man, half beast, who spends his afternoon in pursuit of sexual gratification in the heat of the midday sun — so it’s a bit more sexually supercharged than the story of Bambi. Let’s go on and think about the type of music that we’re about to hear here. It’s a different kind of music, and maybe the best thing to do is just jump into it. For us, it’s difficult to appreciate how strange this must have sounded. We’re kind of used to this sound. We’ve gotten — and maybe you’ve heard [plays piano] augmented triads and there are a lot of [plays piano] major seventh chords in Debussy, sounds a bit like a jazz chord, yeah, because jazz [plays piano] performers like that sound. They heard it in the Impressionists and they drew it into their music. So there are strange chords here, but there’s also strange orchestration, and once again we should remember how unusual this must have sounded at the time it was created. So let’s listen to a little bit of the Prelude to the Afternoon of a Faun, picking it up about — it’s in ternary form. We’re picking it up in returned A. See if you can tell me what the meter is here. [music playing] Okay. Let’s just pause it there for a moment. Anybody know what the meter is? No. I don’t either. I’d have to look at the score and I never look at the score for this course. That seems like cheating. I shouldn’t have any more advantage than you do. So it’s a little hard to know what it is there. We — I’d really have to go get the music and find out what it is there. You heard kind of little harp glissandos in the background. We’ll be talking more about that — the harp playing away there, arpeggios periodically, [sings] or [sings], just little dabs of color underneath by way of a supporting accompaniment. So let’s listen to a little bit more here. Focus on the flute line. That’s got the melody but it’s a kind of different melody than the melodies that we have been listening to. [music playing] Passed it to the oboe, [music playing], okay, pausing it there. So that melody, [sings] is kind of like a roulade, kind of ill-formed in a way. It’s very beautiful, but it’s difficult to sing. It’s chromatic, it doesn’t have any regular structure to it, and this is typical of the Impressionists’ approach to melody. Well, as I say, this was somewhat shocking at the time. This is Debussy’s response to a poem, and you have the poem there. It’s given to you on the sheet for today. Everybody got the sheet? We’re not going to read it because we don’t have time for it. It’s a good example, however. So Mallarmé then went to the first concert of this piece and here’s what he said in turn about Debussy’s music. Quote: “I never expected anything like it. The music prolongs the emotion of my poem and paints its scenery more passionately than could colors,” — paints it, so music as painting. Well, with this idea of music as painting — because these two artistic disciplines can’t be separated really from one another — let’s turn to our first slide for today and we’ll see how this works. What’s this? Anybody know this? Kind of a classic of Impressionist painting, “La Grenouillère,” the frog pond, painted by Monet. I don’t know the date, probably 1874 or 1875, I would guess. And we get this general impression of it. If we look, however, at the brush work of it, and let’s go to that, a kind of close-up, we see — here we are — that it’s really made up of a series of individual gestures. There’s a mark there, a mark there, and so on, but when we — let’s go to the next slide — stand back we do get this sort of shimmering impression, and there’ll be a lot of that, the same kind of effect, worked out in music. Yes, you can have a chord, but that chord could be played as an arpeggio, and you could pedal with it and you could play it very rapidly and you wouldn’t notice the individual notes. You would get the effect of the impression of this general wash of sound so that, in some ways, is a similarity here between these two artistic disciplines [music and painting]. Let’s go on to the next or maybe that makes that point. No. This is fine. All of that music up to that point is made up out of a new kind of scale, a scale we haven’t talked about before but now’s the time. It’s called a whole tone scale. Remember when we have [plays piano] our octave [plays piano] with our — it may take a major scale in there — our octave divided into seven different pitches, five whole steps and two half steps. But supposing we traded in those two half steps for one whole step. So instead of going [plays piano] C to C in that fashion, we would be going [plays piano] — now I got to do a whole step [plays piano] — so that’s a whole tone scale, all whole tones within the octave. There are a total of six of them there — just converting two half tones into one whole tone. So all of this business [plays piano] and so on, just running up and down a whole tone scale. All right. Then at this point where we stop, [plays piano] well, underneath there — you’re listening to the whole tone scale up above — but underneath we’re getting [plays piano], kind of a rocking anchor. What is this in music, when you just repeat something over and over again? [plays piano] A.J. Professor Craig Wright: Ostinato. Thank you very much. So we have ostinatos coming back into music here in the Impressionist period. They were there in Baroque music. They kind of went out of fashion in the Classical period and in the romantic period. Romantic is too expansive for ostinatos, but they come back in here in the Impressionist period and they’re really important in the Modernist period. So it’s a harbinger of things to come in the Modernist period. What’s that? Well, it’s a classic example [plays piano] of a glissando. Right? They use a lot in television and stuff. What’s behind curtain number three? [plays piano] “Tell us, Vanna,” or whatever. So it’s simply playing an arpeggio — an arpeggio that’s very rapid family, kind of — or fashion. [plays piano] That’d be another sort of glissando, just playing every white note or every [plays piano] black note, okay, up on the keyboard. So we had this glissando [plays piano]. All right. Now let’s talk about the scale we have here because he’s actually changed scales. We did have [plays piano] whole tone but now we get [plays piano] a pentatonic scale, just using five notes. [plays piano] We’ve bumped into the pentatonic scale before. Anybody remember when, way back early on? Roger. Professor Craig Wright: I didn’t hear that. A little bit loud. Professor Craig Wright: Yes, to some extent. It was in that lecture where we were talking about blues. Blues tends to use more of a six-note scale, but it was at that very point. What kind of music was it? Emily. Now one other interesting thing going on, and that is the combination [plays piano] of — which is what he’s doing here — of parallel motion and the pentatonic scale, because — [plays piano] Does that conjure up any — Chris is smiling down here. Why are you smiling, Chris? What does that remind you of? Professor Craig Wright: All right. The Far East. Indeed. But when I was a kid growing up if I heard [plays piano] I would be watching Indians coming over the horizon in the West and the good guys or the bad guys were chasing — it was a sign of the Indians. What this was — what this became in terms of film music was a kind of racial stereotyping. We had “us” and “us” went along [music playing] in major and minor scales, and then we had these other people [plays piano] who generally moved in parallel motion and used a lot of pentatonic sounds. So the people in Hollywood were painting here ethnically with a very blunt brush. It was “us” in Hollywood in major and minor and functional harmonies and it was “them” who went around in pentatonic scales and in parallel motion. It was a very interesting kind of moment there in the history of American musical culture in a way. So in any event, that’s what we have in this particular piece. Debussy is using this here, and I’ll come back to this a little bit later on, because Debussy was very much influenced — and we can document where and why — very much influenced by the Orient, by the East. He was hearing these Eastern sounds in Paris beginning in eighteen eighty-nine. All right. Well, then this thing goes back [music playing] to a whole scale — a whole tone scale and then finally — [plays piano] And he instructs the pianist there just to leave the foot on that sustaining pedal there, that rightmost pedal, the sustaining pedal, [plays piano] so we get, again, this wash of sound. Okay? Now one other point about pedals, while I’ve got — while I have the — I’m at the keyboard here — and that is the following: We’ve talked about the rightmost pedal [plays piano]. It gives us [plays piano] this kind of wash sound. What’s it called, once again? What’s the rightmost pedal called on the piano? Yeah, I hear it over here. Who’s got it? Kristen? Professor Craig Wright: Okay. Who said that, please? Professor Craig Wright: Okay. Thank you. This is the sustaining pedal, right, and it gives us the wash of sound. What’s the leftmost pedal do? [plays piano] Frederick. Professor Craig Wright: That’s right. Moves the whole keyboard over so those hammers are only striking two strings rather than striking three strings. It makes it a little softer. The middlemost pedal, however, is a very interesting one. It doesn’t get used nearly as much, and I was thinking this morning. I was looking in my office on my Steinway upright and there is no middle pedal. And that’s because it doesn’t get used very much. But when it does get used, it’s used for sort of special effects. Let me show you a good example in another prelude of Debussy. And this is a bit, oh, hokey I suppose but it’s called La Cathédrale Engloutie, the engulfed, or sunken cathedral. And of course Monet painted the cathedral over and over again, all sorts of different views of this cathedral in different kinds of lights. Which cathedral was it? Notre Dame de Paris? No. Any art folks here? Sure. Jacob, which cathedral is it that Monet — show the next slide, please. Okay. So that takes us to the end of this particular prelude, and I have a lot of other things I’d like to say about Impressionist music, very interesting stuff. I think I’m going to cut to the chase, however, with just showing you a few slides because we have a guest that we want to talk with and she is here, and we want to move on to that. In the textbook, and you can read about this in the Impressionist chapter in the textbook — let’s go on, Jacob, to the next slide. And the point here is the association of color. Now that’s one approach, but Debussy starts doing something a little bit different. He’s going to start working just with color — a little bit, if we can get to it, of an orchestral piece with Debussy where he’s using a new instrument. It’s the human voice. What’s the instrument singing here? [music playing] Not singing much of anything, just singing “ah.” It’s just — what he wants there is the warm sound, the stable, warm sound of the human voice, and — as Thomas Mann said — and he just brings that in, a little dab of color there, a little dab of color there. What’s interesting him is not line but just color. He’s going to pull in color away from line, and that begins to happen here in the painting of the period. They begin to intensify color and separate color from line. Here we have Matisse, nineteen oh-nine, “The Dancers.” This is version one of this. You may not know that he actually painted this particular scene twice. Version one, notice just the kind of flesh-tone colors; notice the position of the knees. Now we’re going to go to version two, two years later, much more intense. The position of the legs and the hamstrings here is much more angular and we have a much more visceral response to this because of the addition of the red color to it. And red becomes a very important color with the painters of this period and they begin to take this color and just play with the color itself outside of line, which is what Debussy is doing. So let’s go on to the next slide here. Here is Matisse’s “Red Studio,” for example, where the color red begins to overrun everything or in musical terms let’s go to Duffy’s “Red Violin” here where the red varnish quality of the violin is spilling out — outside of the line or normal confines of the instrument. So that’s an interesting point, I think — to watch these two arts work in tandem at this particular moment in history. All right. I’m going to stop here and introduce our guest, Naomi Woo. Naomi, come on up. I’ve never met Naomi, right. But it’s nice to see you. Thank you for joining us today. So you’re a pianist here at Yale, and we’ll — So here’s Naomi and we’re going to turn the lights back on. So tell us about yourself nice and loud if you would, please. Are you a music major? Professor Craig Wright: You’re a freshman. Professor Craig Wright: Interesting. So why didn’t you go to Juilliard then, or Eastman? Professor Craig Wright: That’s a smart move. I did it the wrong way. I went to — and it was a wrenching experience to go to the Eastman School of Music first and then go to Harvard after that because you really felt like a dummy. At least I did and rightfully so. So you’re doing it the correct way. I think generally, whatever your trajectory is in terms of your particular profession, get your broad liberal arts background first and then focus more and more intensely on your specialty and then subspecialty and on it will go. So here you are taking piano lessons. With whom do you study? Professor Craig Wright: So he is a faculty member of the School of Music across the street and our most talented undergraduates go over there to get their lessons and they do their practicing. How many hours a day do you get to practice? Naomi Woo: I try to practice two hours a day but I usually can’t do that more than a couple times a week. Professor Craig Wright: Okay. Well — yeah. That’s hard. That was the thing that was so weird about these conservatories. They go down in these practice rooms and six hours later they come out. They spend their entire time in there. It was like learning to be a great plumber or something like that. It’s not a very broadening experience. Okay. So you’re practicing two hours a day. Does that annoy the people all around you? Professor Craig Wright: Okay, but how — I thought that was just for the School of Music students. Professor Craig Wright: I see. So you’re kind of a special group. If Daniel decides he wants to practice over there, they’re not going to let Daniel have a key to the treasury. Okay, but we are right across the street. What are we building over there? A new music department building so we’re going to have a lot more practice facilities in the basement of that principally for undergraduates. All right. So this is something that always interests me. We have a little time to talk about it. How good is your — these kids that are good at this music business, they’re good for a reason. It’s because they have some talent and oftentimes this is aurally perceived talent. So how good an ear do you have? I’m not going to quiz you on this. I like to quiz people on this but tell me about this. Professor Craig Wright: Were they musicians? Professor Craig Wright: What do they do? Naomi Woo: My mother’s a doctor and my dad’s an economist. Naomi Woo: And I’m actually considering being a math major. Professor Craig Wright: Yeah. I knew that was coming. So you may not have absolute pitch. You probably don’t have absolute pitch. Right? Professor Craig Wright: Yeah, but you probably have a very good sense of relative pitch. What would have happened if you started out — well, was piano your first instrument? Naomi Woo: It was piano. Professor Craig Wright: It was. Supposing you had started out on — and what — how old were you when you started? Naomi Woo: I was five. Professor Craig Wright: Five. Okay. So you were a late starter. No. [laughter] Sometimes — Kensho, who was in here — what did he say? He was three when he started with the violin. Had you started with the violin, do you think you would have absolute pitch? Professor Craig Wright: Wait a minute. You play [laughs] violin also. [laughs] Really? Professor Craig Wright: You play in the YSO. That’s really hard to get in the YSO, folks. That’s very competitive. Oh. Okay. So how old were you when you took up violin? Professor Craig Wright: Okay. So what did you learn from that and what do we conclude from that experience? If you wanted to develop absolute pitch, what would have been the sequence in which you would have been exposed to these instruments? Naomi Woo: The violin first. Professor Craig Wright: The violin first because it forces you to think about pitch constantly, like the Eastern languages are — so many of them are tonal languages. You have to think about this issue of pitch early on and statistically you — somebody did a study of violinists of Asian nationality or descent at the Eastman School of Music and something like sixty-four percent of them had absolute pitch, and it’s a combination, I think, of working with a stringed instrument and working with a tonal language, in many cases. So it’s a very interesting phenomenon and it sure is very helpful when you go to play these instruments ‘cause you don’t have — if you can stream the music, you’re not going to have memory lapses and things like that. So now we have a piece and we’re going to have you play this piece, [Ravel’s] “Ondine,” from beginning to end. It’s based on another poem. We’ve given you the poem for today but it’s not really relevant — or that relevant. What’s this poem about, Naomi? Have you ever looked at the poem? Naomi Woo: Yes, I have. Professor Craig Wright: So what’s it do for us? Professor Craig Wright: Uh huh. And so when you play this do you think of — because we do have the text there — do you think of particular moments in the poem? Professor Craig Wright: Oh, really. Professor Craig Wright: Do you want to play one and — yeah. Wonderful. Thank you so much. That was wonderful. So as Ondine flies off, you will fly off now to your next class. Thanks very much.